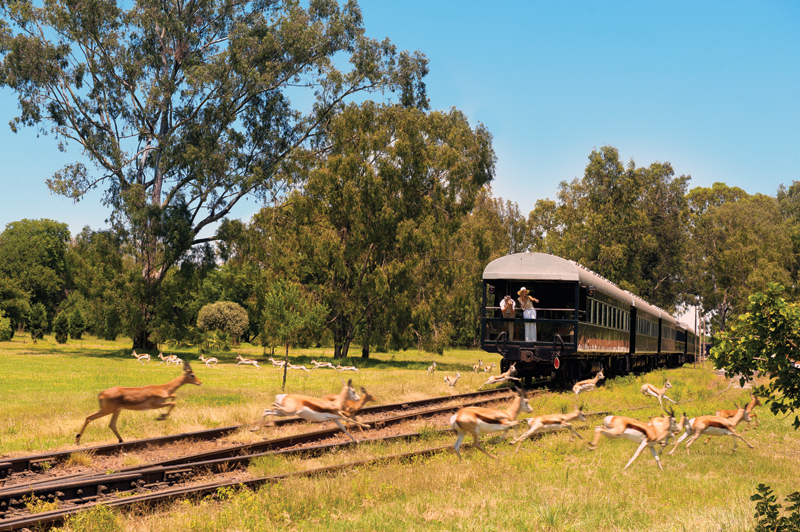 The Rovos Rail journey from Pretoria to Victoria Falls has certainly become a firm favourite. We recently had guests, Mr and Mrs Hume, who travelled on this journey in celebration of their 80th birthdays! They took the time to send us a lovely e-mail but also a really kind and enthusiastic review on their trip. Thank you Mr and Mrs Hume and happy birthday from all of us at Rovos Rail! Rovos Rail was simply transporting. In so many ways. 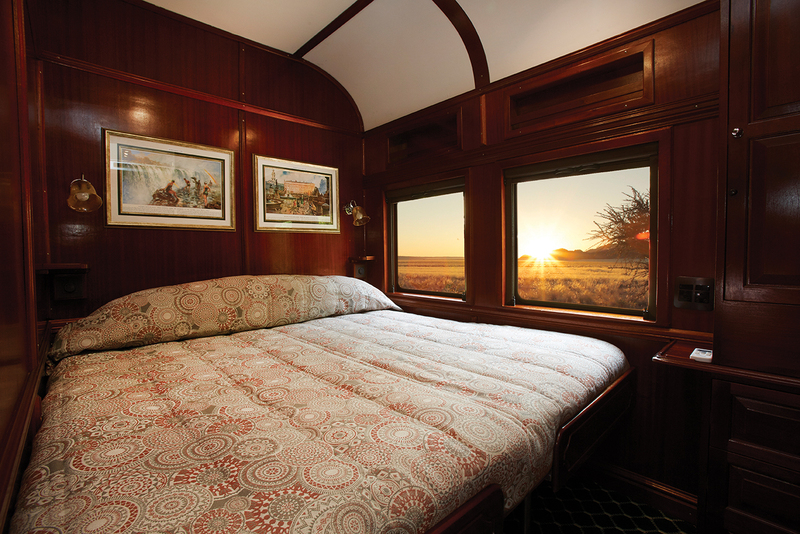 Born of the dreams of a tall, handsome visionary who dreamt of having a private refurbished train on which to take his family on a tour of South Africa, it soon evolved into one of the most luxurious trains in the world. Rohan Vos (pronounced “Foss”), having obtained permission from South African Railways to operate a private train, soon found that the myriad of petty fees and costs levied by the state operator, made a private train simply unaffordable. So, not to be daunted, Vos expanded his idea into a commercial tourist train. 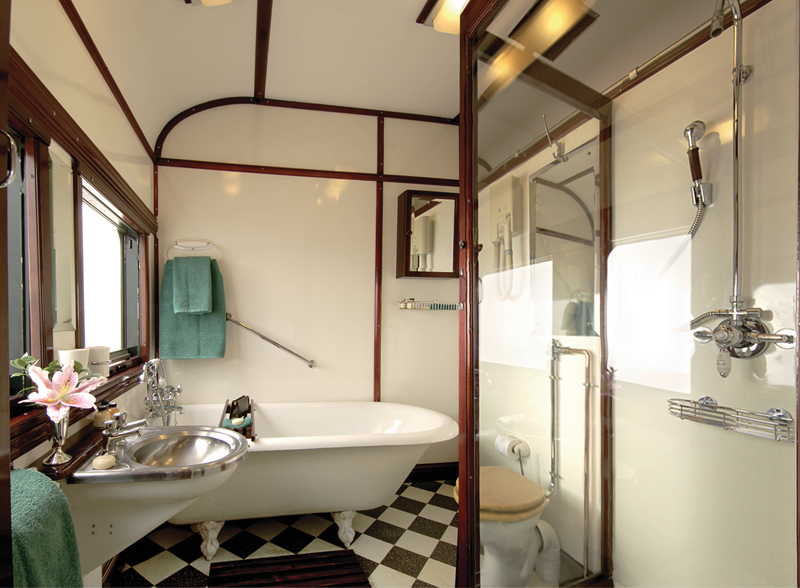 Following his passion of transforming derelict rail carriages into masterpieces of mahogany-paneled Edwardian grandeur, finished with the finest brass and silver trimmings and crimped, etched glass lampshades, Vos has created a traveling jewel which affords the discerning traveler the chance to glide through the rugged African veldt while being pampered in the best ways known to man. Brother David had driven us from his home in Johannesburg to the start point. But at first we had trouble finding it, nestled as it was under unlikely tall palm trees in a disused section of Pretoria’s railyards. Adding to its sense of mystery. Then there it was, a colonial-era station house, transformed into a spacious, gracious lounge filled with leather couches and period pictures, all gently blown by the breezes of twirling, broad-bladed ceiling fans. Young waitresses plied the guests with trays of champagne in frosted flutes. We had arrived. The sense of expectation was electric. Vos himself seems to treat the departure of every train as a landmark event in his family’s history. He was there in person to shake every hand and wish everyone a good time. Before boarding he devoted almost a full hour to explaining the history of ROVOS, and to giving his guests a tour of the workshops adjoining the station house, where coaches are refurbished and train pieces from bogey wheels to window latches are serviced and repaired. For our amusement he had arranged for one of the original steam engines to be drawn up at the siding. We crawled all over it, amid its wisps of escaping steam, like kids on a Jungle Jim, striking poses for each other’s cameras. Eventually, we boarded. Our bags already loaded into our spacious cabin, we soaked up every detail of the luxury hat engulfed us. 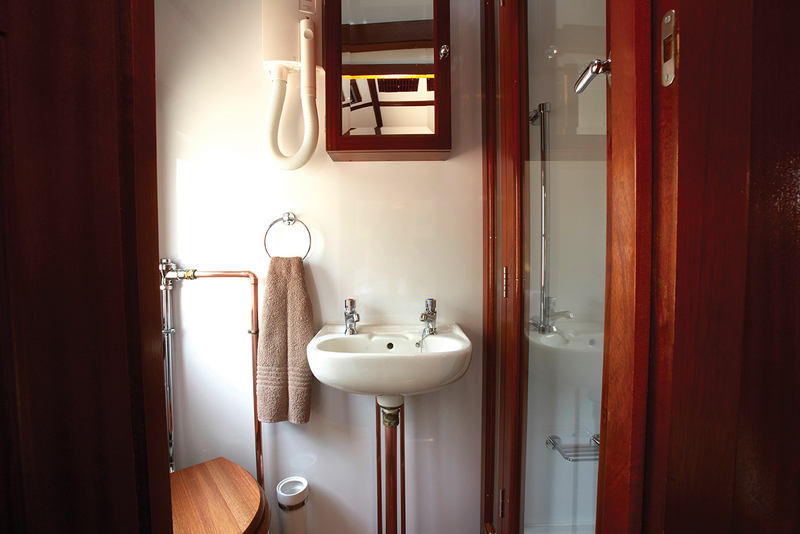 The broad double bed, the warmth of the wood panels, the space, the work table, the adjoining shower room and toilet, the ample hanging and cupboard space, the mini-bar, to be stocked up as we ordered. What else could there be? We were soon in the Observation Car, chilled Chenin Bancs in hand, the logoed cut-crystal glasses glistening like golden orbs against the arid grassy plains passing beyond the windows. Lunch was as much a dream as a meal. 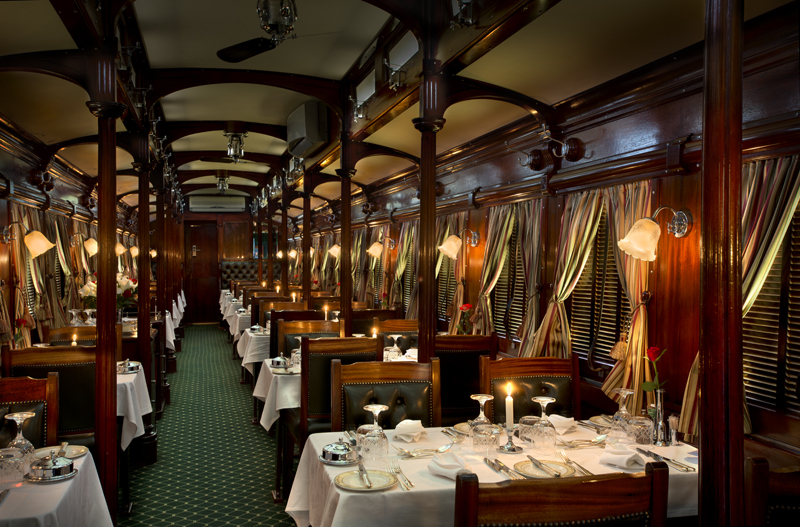 We struggled to balance our focus between the scrumptiousness of the food and wine and the beauty of the fittings in the ornate Dining Car, with its tasseled velvet curtains at each window. Mini-quiche served with Hamilton Russell Constantia Chardonnay was followed by grilled salmon on rice with asparagus accompanied by Sutherland Saugivnon Blanc. All served under the regal audience of a large Protea flower, one per table, South Africa’s unique symbol of enduring elegance. Echoed by the pleasure of Meriel’s ethereal presence . Butter balls in a silver-plated dish completed the picture. 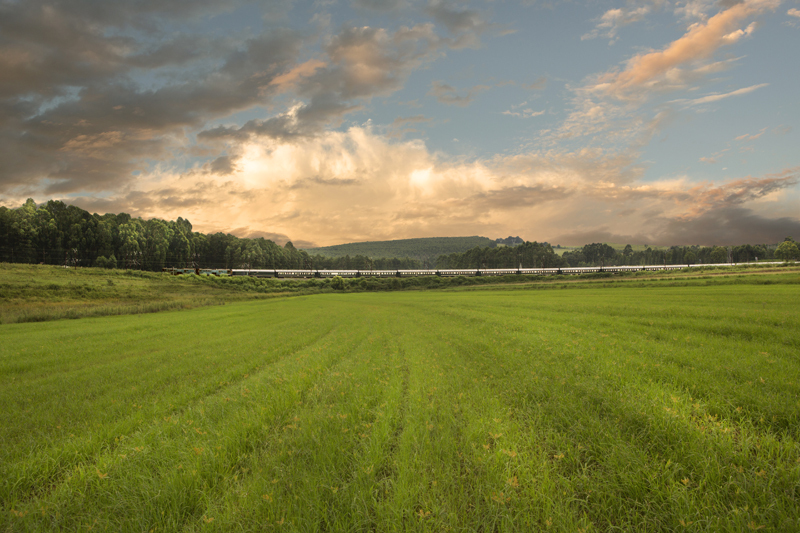 As the train gently lurched its way forward my history came into focus. We crossed the Limpopo at Beit Bridge, named after Sir Alfred , Cecil Rhodes’ minor partner in the De Beers diamond company, . The fund he established helped finance my Doctorate at Oxford. Bulawayo, place of my birth, was up ahead. First would come Collen Bawn, famous century-old quarry and cement plant, then Gwanda, Balla Balla, and, finally, Essexvale where, about a hundred years ago, my father Denny cycled out with his gold pan to prospect the streams. We stopped at Gwanda to visit a curio market. Besieged by politely badgering African kids the Rovos guests shuffled from stall to stall against a backdrop of African singing as a troupe of young locals vigorously danced for us. By now dusk had fallen and I knew I would not actually see these places, but would be in them. Night would steal them from me as history had already done, almost. So that night we slept near Bulawayo without seeing it, at Mpopoma. After sunrise our journey continued and more names, each with memories, came into view: Pasi Pas where Denny had taken me one day in the late 1940s to buy sandstone from the quarry to build our house on Norfolk Road; Nyamandhlovu (“flesh of the elephant”) where my Plumtree classmate Mike Wood’s father had been Native Commissioner; then Saw Mills once the center of Rhodesia’s hardwood industry (Yellowwood an Muqua), now standing weeded and overgrown, grazed by a small herd of motley looking goats. 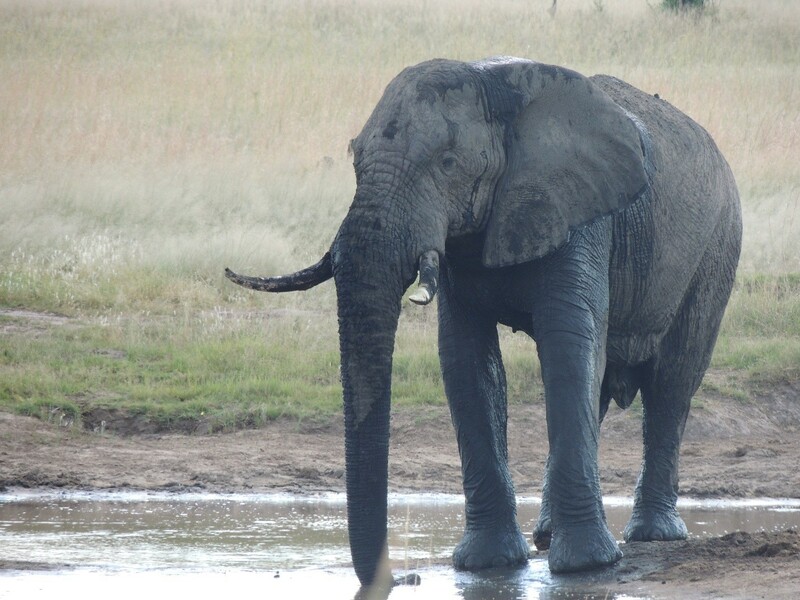 Gwaai River would be next, followed by Dett and Hwange where we are to stop for a game drive. The game drive exceeded all expectations. Starting early on open, tiered-seat Jeeps (supplied by The Hide) there was a sense of exhilarating excitement cruising across Hwange’s endless grassy khaki-colored grasslands. We saw few animals to start with. It was still too warm for them to start their evening browsing. There were a couple of giraffes and a lone Impala bull, partly hidden in the shade of thickets, and some bird life but not much else. Cleophas the guide had asked us what we would like to see. We all said, predictably, “The Big Five”. One guest said “Cheetah” and I added “Kudu”. “The Big Five not possible” he said, “because Hwange no longer has rhinos. 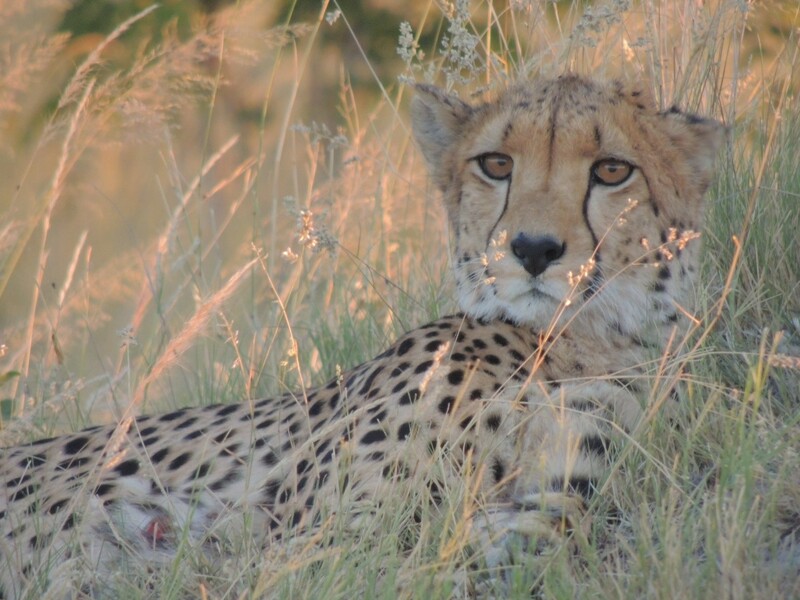 Cheetahs not guaranteed and Kudu unlikely but we can hope..” He finished. He said we could see lions but they were 30Kms away. We said that was too far. 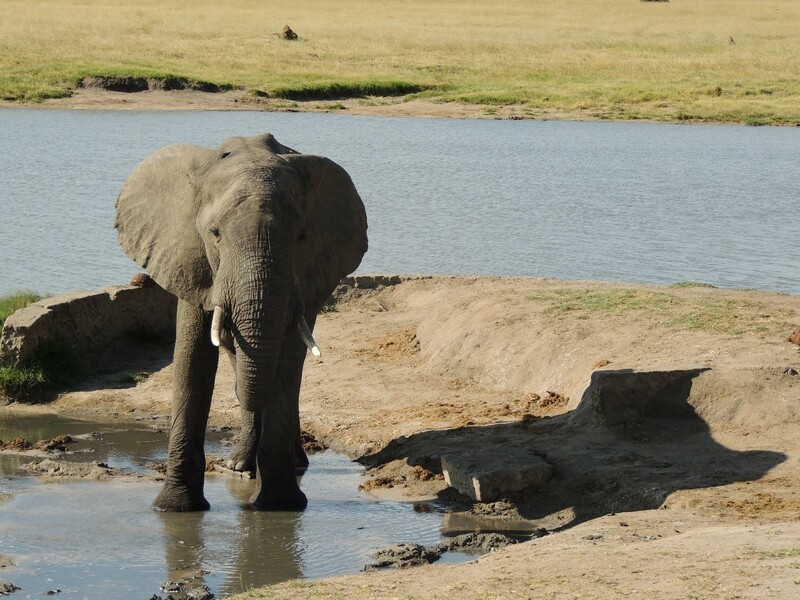 After a while, deep into the plain we came across a muddy watering hole in which there was a lone elephant bull. It stood motionless like an apparition, its tusks completely covered in glistening black mud like a dark chocolate version of itself. “This bull” the guide explained “has probably been estranged from the herd. He may be in decline and is facing his own extinction in what will be a lonely life from now on.” We left him alone and moved to another water hole with four more younger bulls, caking themselves in mud and dust. Cleophus explained that, once thus covered and caked, they would find a tree and rub their sides against it. Any ticks and other parasites apparently get ripped off the elephant with the caked mud. Tuskers toilet. As we left the elephants another viewing Jeep closed on us, saying that the reported lions were still at the same place. We decided to go there. On arrival we saw only a small green patch in the sea of golden grss, with sme scattered bushes and a fallen tree trunk. The we saw that there were two huge male lions, one lying on his side snug into the bush for the shade, the other stretched out below the fallen tree trunk. We came within a few yards from them. They showed no interest in us at all. Occasionally the one would look out into the distance across the plane. We did not know it at the time but he was eying his mates, three lionesses hidden in the grass a half mile away. As we watched the lion under the tree trunk rolled into its back, turned its head lazily and gazed at us with his head upside down. Sizing us up from down under. Before long, as the sun lost its heat, sinking towards the horizon and throwing a liquid gold light across the glowing pain, we suddenly saw that it had come alive with animals. 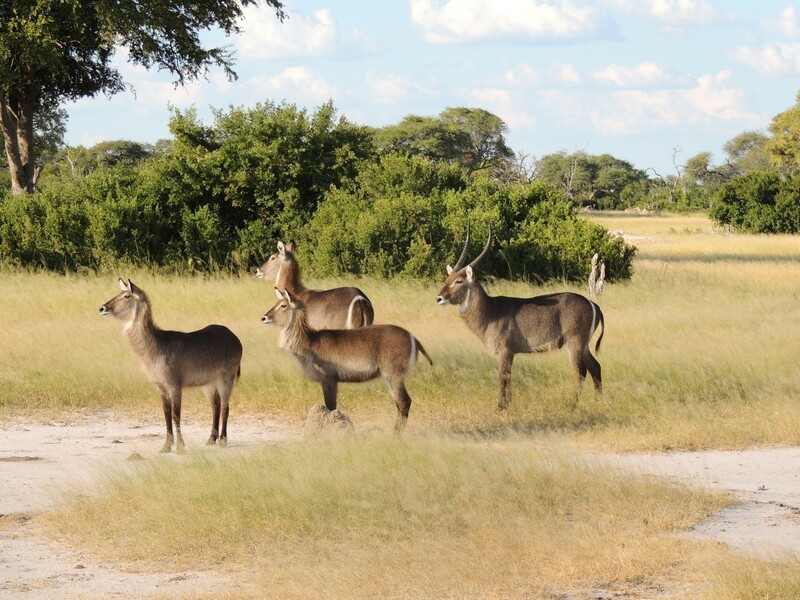 Herds of Impala appeared from nowhere, there were giraffe gliding like glinting cranes through a patch of trees, we saw two Kudu does, and there was a family of waterbuck not far from where the lions lay. Cleophus explained the waterbuck were not afraid of lions, partly because they knew did not favor the taste of their flesh, but also because, strong swimmers, they could take to the water if attacked. They made a regal sight as they stared across the pain. As we drove quietly away, Cleophus suddenly stopped the Jeep some yards from a small grass-covered mound. “Cheetahs” he whispered. Then we saw the two small heads of the cubs, ears twitching in the sunlight as they gazed intently outwards. As Cleophus moved the Jeep some feet forward we could then see the mother. Sprawled languidly across the back of the mound, mostly hidden in the grass, she stared intently across the plain with steady, sullen eyes. Was it to be Impala or something else for dinner? We moved on. 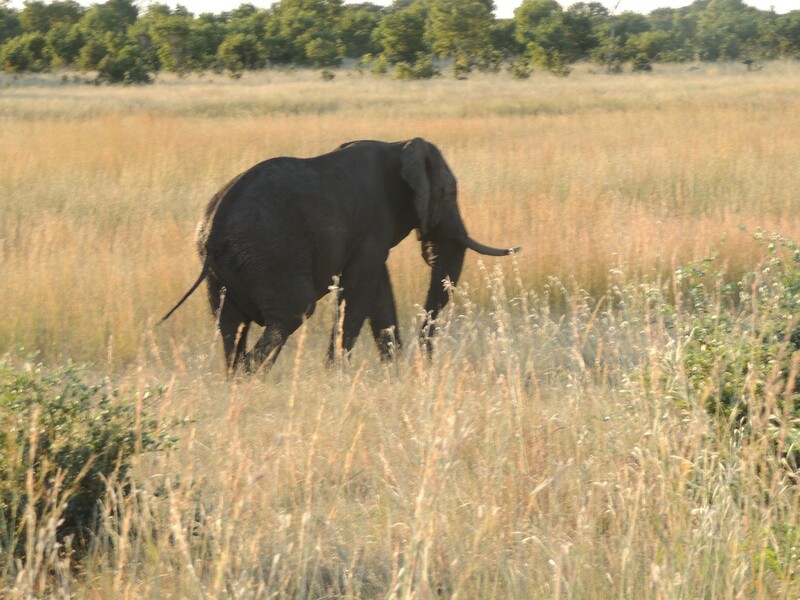 In the mosaic that is the Hwange reserve, patches of rich green grass and scrub intertwine the pale khaki of the grassland. In one such patch we came across aa small herd of Zebra grazing actively in the declining daylight. The whiteness on their beautifully plump and proportioned bodies glowed brightly like liquid silver in the sunlight between the jagged stripes of carbon blacking. Lionfish of the plain. Their high manes gave them a full-dress military look, like Trojan Centurions trussed up by Versace. It was time to begin to head back to base camp, close to the train, where drinks awaited us. By this stage we were all elated and flushed with joy. We had not seen The Big Five, but close. Nic had seen his Cheetah, I had seen my Kudu. Nic then shouted that he saw more elephants up ahead, crossing the road. As we snapped our gaze in the direction of the elephants none of us could believe what we saw next on the road ahead of us: a huge male lion, followed by a lioness, sauntering on the bare sandy earth of the roadway towards the Jeep. The male lion did not stop when he saw us, but just kept walking. Less certain, the lioness went to ground and, her belly on the sandy surface, watched intently. 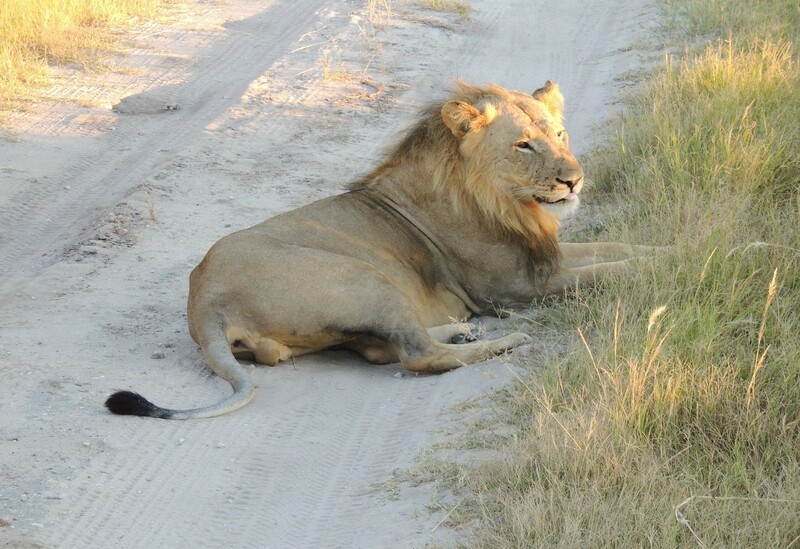 The male lion just walked slowly but relentlessly right up close to the Jeep. Seeing that we were not going to move, he padded into the grass on the side of bare track, a few feet from where we sat watching. The jet-black tassel on the end of his tail was twitching, as if nervously, as he passed us about four feet from the edge of the vehicle. Once he had passed us he simply spun round and lay down to rest no more than six or seven feet from the back of the Jeep. Nicolas had taken a video of the whole incident. Who said we had to drive 30Kms to see lions? Nicolas reminded us about the herd of elephants up ahead, so we drove on towards where they had been. 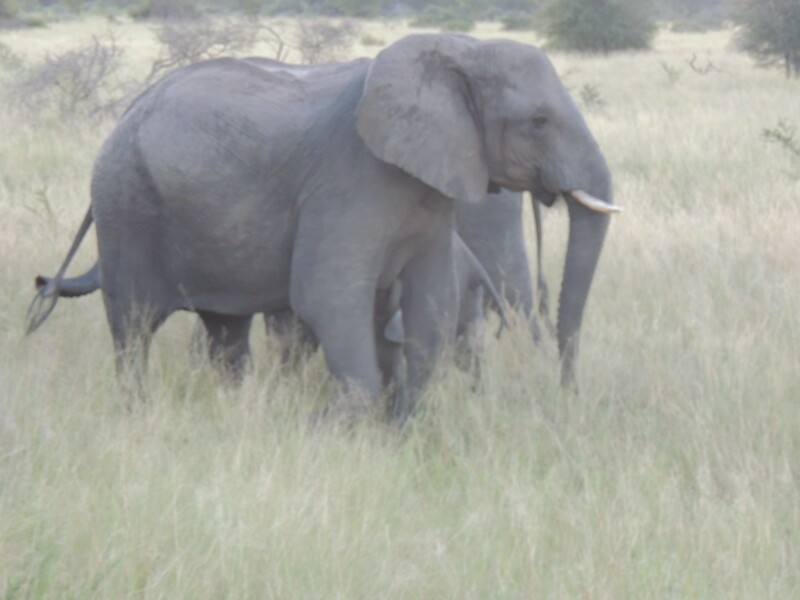 Sure enough, we rounded a bend in the road behind a fleeing flock of Guinea Fowl that sprinted un the road ahead of us, we found ourselves in the midst of a large herd of elephants. Some of them, particularly the younger ones of which there were many, flapped their ears furiously, lifted their trunks skywards and emitted coarse hissing sounds. It was time to return to base camp. We had had a thrilling set of episodes, it was invigorating out on the plain. Birds were everywhere chasing insects in the dying light. The sun had suddenly melted into a faintly crimson glowing orb. The game view was over. The whole train was now gathered for drinks and grilled snacks at a camp facility, part of The Hide operation. 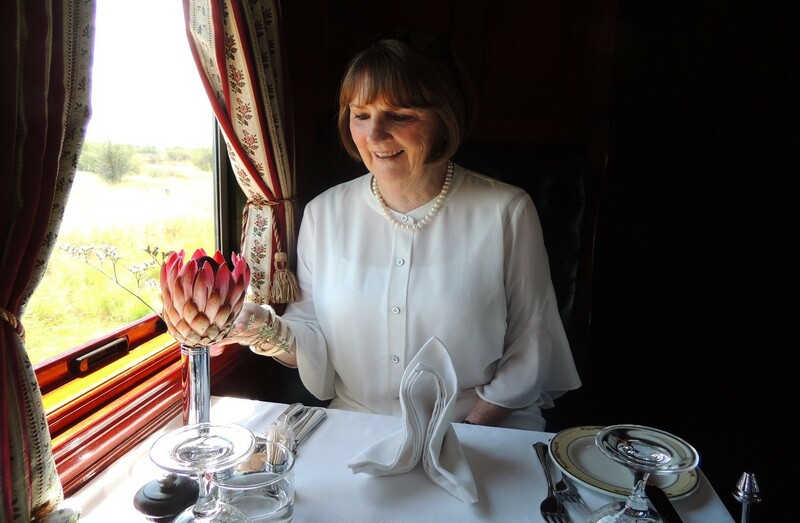 In an amazing act of management prowess ROVOS had decamped the whole drinks camp, had guests all re-board the train and within an hour served a corsage and candle light final dinner in the Dining Cars. Bravo ROVOS! 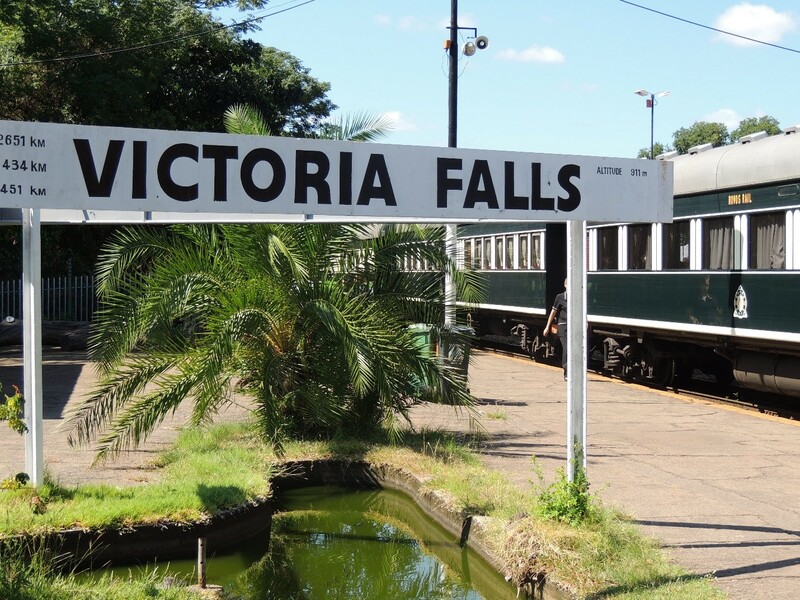 All that was left of the ROVOS Rail trip was for us to arrive at Victoria Falls. There it was suddenly, distant spray rising out of the dense bush, a siding sign, glimpses of the white facades of the gracious Victoria Falls Hotel, and the sounds of African harmonies, as a group of leopard skin-clad Shangaans danced and sang a welcome on the platform. A magical dream had ended. A new welcome awaited. Autumn has arrived in South Africa and that means our annual Winter Warmer is here! This offer available to South African passport holders and SADC member states only. 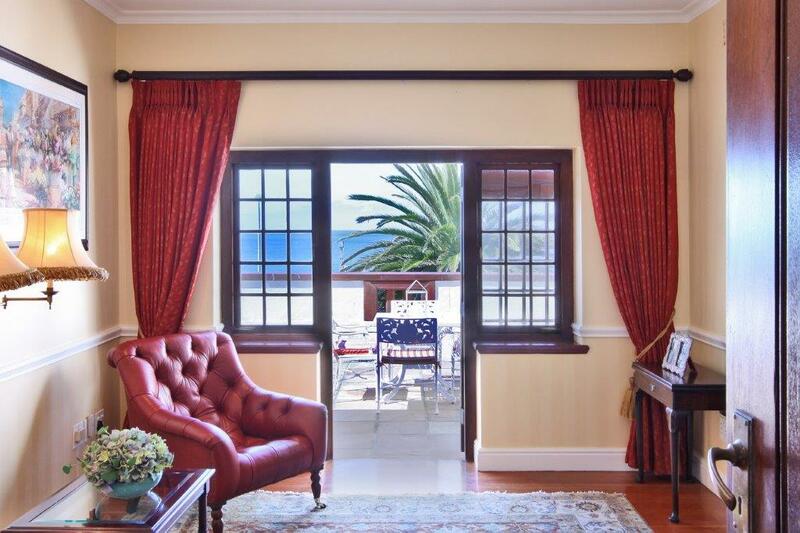 The Winter Warmer is a 2-for-1 special on our two-night Cape Town journey and is available from April to 30 September 2019. 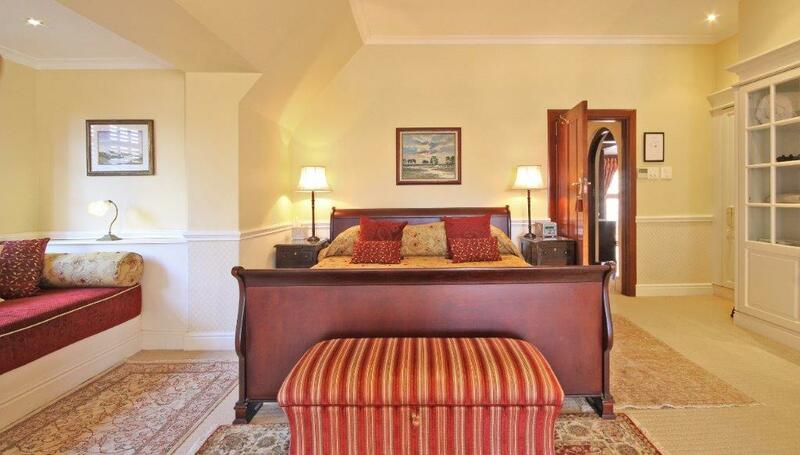 The offer is for a one-way journey for two people sharing in a Deluxe suite. 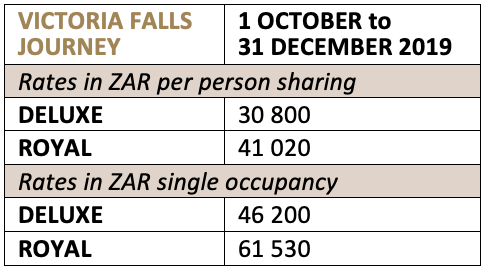 The 50% reduced rate is R15 550 per person sharing in the Deluxe suite (normal rate is R31 100 per person sharing). The rate is fully inclusive of all meals on board, all alcoholic and other beverages on board, the off-train excursions, 24-hour room service and a limited laundry service. It does not include flights, transfers, pre- and post-tour accommodation or gratuities for the train staff. Cuddle up on board with us this winter and travel from the grasslands of the gold-rich Highveld to the haunting barrenness of the Great Karoo; trundle the spectacular mountain ranges and scenic winelands of the Cape. Should you require further information please get in touch by e-mailing reservations@rovos.co.za or call +27 (0) 12 315 8242 (Pretoria) or +27 (0) 21 421 4020 (Cape Town). Visit our website here. PLEASE NOTE: Rovos Rail is 100% reliant on Transnet for its traction and service (diesel and electric locomotives as well as drivers and railway infrastructure). Rovos Rail therefore cannot be held liable for any delays due to trains not running to schedule. Excursions cannot be guaranteed and will only be undertaken if time and circumstances permit. Departure and arrival times are approximate and cannot be guaranteed. We reserve the right to alter our routing at any time between departure and arrival points. We caution against same-day air travel on departure or arrival days due to possible delays with flights or the train. 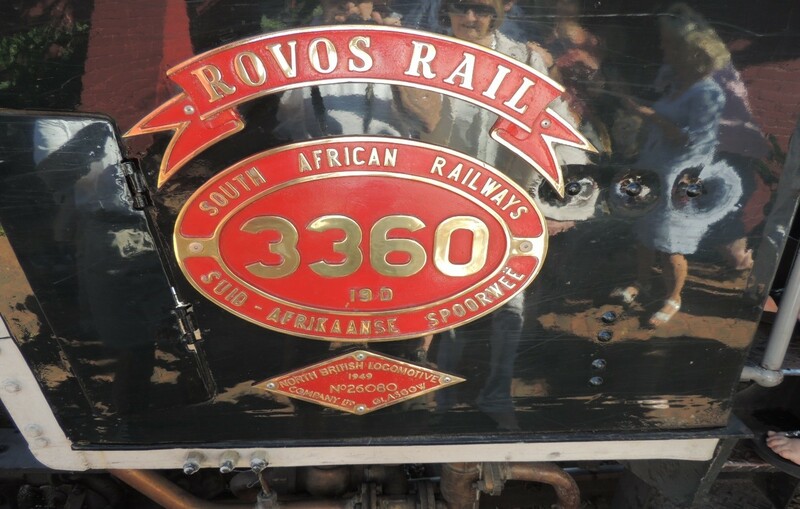 We can hardly believe that Rovos Rail is about to turn 30! Sometimes it does feel like just yesterday that we launched our first seven-coach train for its overnight maiden voyage yet, here we are, 30 years on, with nearly six train sets, 11 journeys on offer and 440 staff members who work tirelessly to create memorable experiences for our guests. We invite you to celebrate with us through our special promotion 30 YEARS – 30% OFF on selected departures from May to December 2019. See rates below for direct bookings only. Special terms and rates are available for tour operators and travel agents. 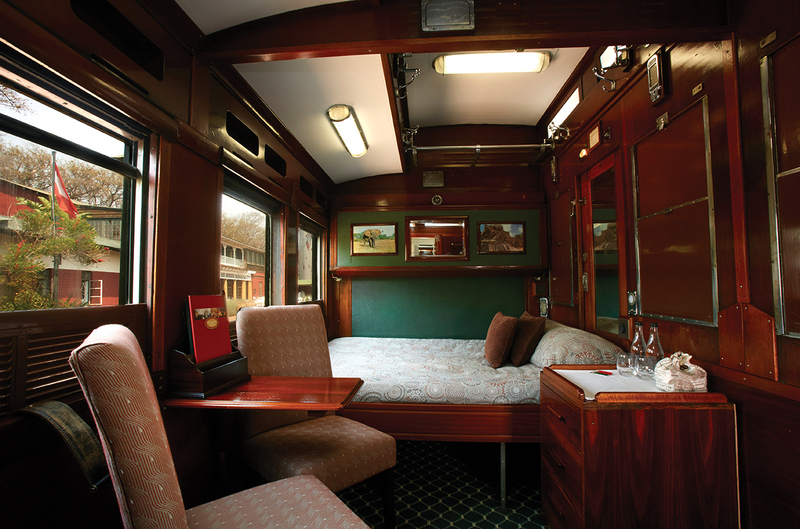 RATE INCLUDES Accommodation on a one-way journey between Pretoria and Victoria Falls or Pretoria and Cape Town; all meals and all alcoholic and other beverages on board; room service and bar facilities; limited laundry service; guided excursions; entrance fees as per itinerary and government tax. RATE EXCLUDES Pre- and post-tour accommodation, flights and transfers; visas; gratuities; international/French Champagne and souvenirs. 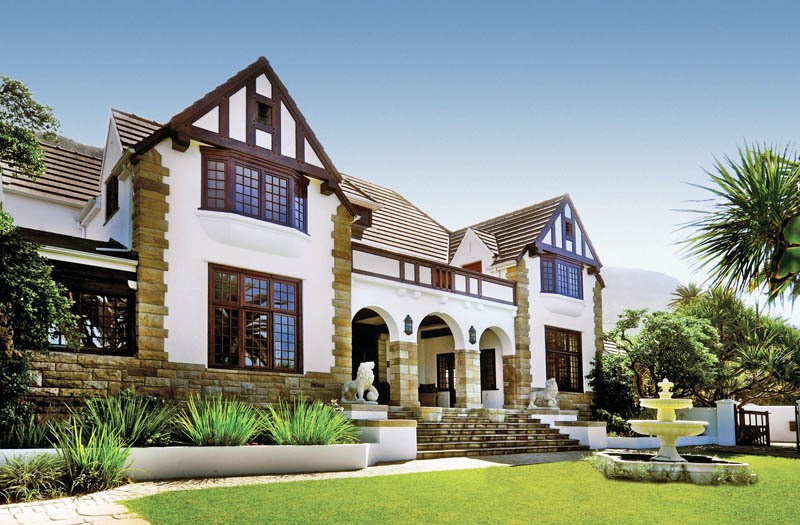 RATE INCLUDES Accommodation on a one-way journey between Pretoria and Cape Town; all meals and all alcoholic and other beverages on board; room service and bar facilities; limited laundry service; guided excursions; entrance fees as per itinerary and government tax + GUESTHOUSE accommodation in a Deluxe room; full breakfast; all alcoholic and other beverages; in-room tea tray and snacks; laundry; Internet; parking and concierge services + a one-way transfer between St James and Rovos Rail Lounge at Cape Town Station. RATE EXCLUDES All other meals not stated; flights; visas; additional transfers; tour services; telephones; gratuities; international/French Champagne and souvenirs. 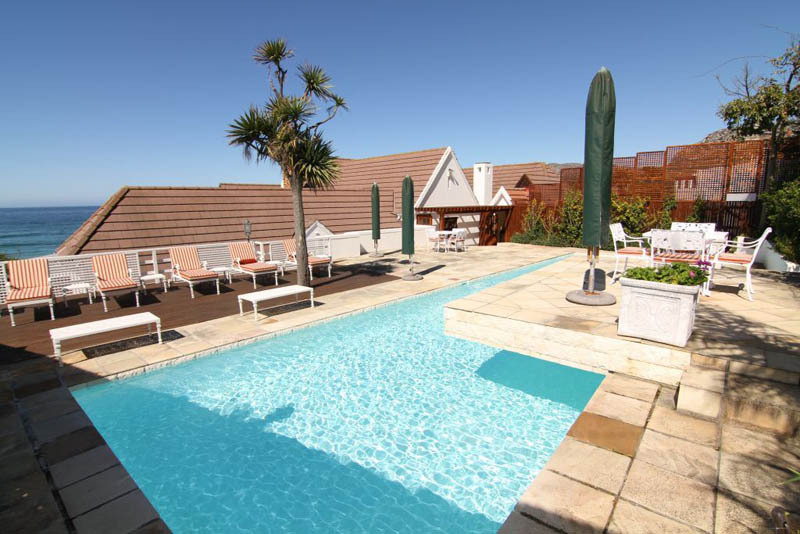 Note: St James Guesthouse 15% vat is included and special rates apply to children under 16 years old. T&Cs apply. Over our nearly 30 years we’ve grown the Rovos Club to over 2000 members which is something we find flattering. When guests join the club it means they’re signing on for more than a ‘once in a lifetime experience’ and that brings with it a lovely satisfying feeling. 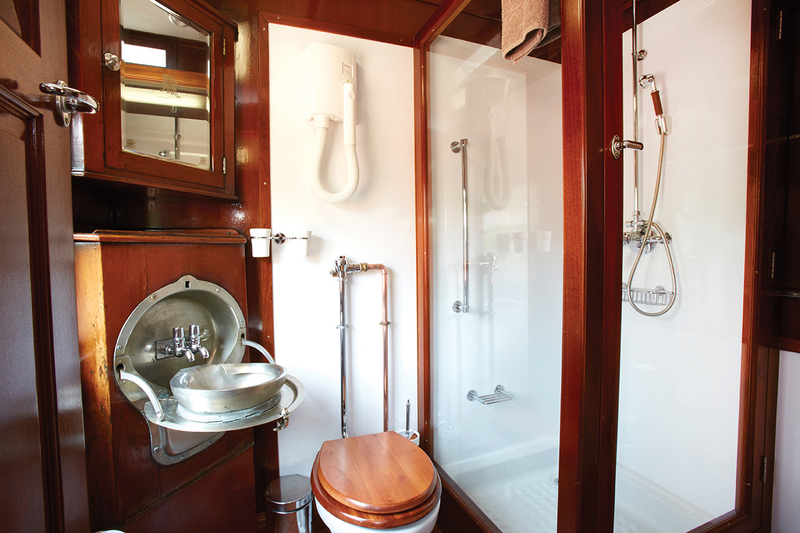 Throughout our nearly three decades of operation we have always aspired to maintain a high standard of discreet and personal service whilst meeting the individual needs of our wonderful passengers. The Rovos Club is an extension of this policy as it creates an opportunity to thank all of our repeat customers for their continued support and loyalty through a personalised incentive-based programme. 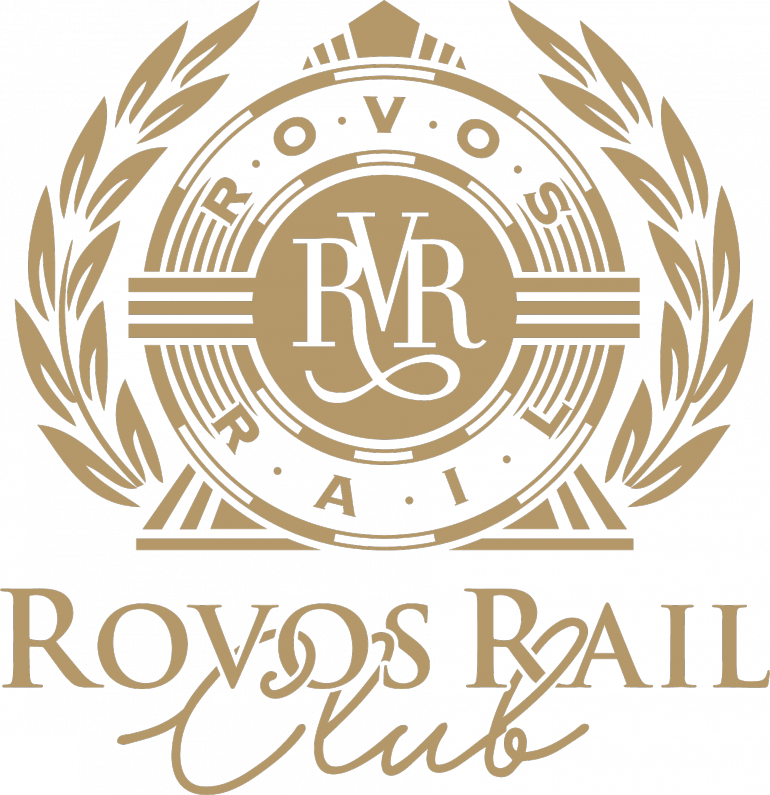 To register with the Rovos Club, one must have travelled with Rovos Rail twice. Club status may be awarded on the booking confirmation of the second journey. If you are eligible for Club status, please use the Club Registration Form or call Dohné Boshoff on +27 (0) 12 315 8242 or e-mail her on dohne@rovos.co.za. Rohan affectionately refers to our Club members as ‘Repeat Offenders’, all who are eligible for a variety of incremental discounts. We’ve been fortunate to host some Club members for their 60th, 35th, 20th, 10th and eighth journeys so they really do feel like part of the family and could probably recite the traditional departures speech verbatim! Should you be interested in joining our club and want to see how it has been structured please click here. We hope you join our club and look forward to welcoming you on board again soon! One of the perks of working in the hospitality industry, especially in food and beverage, is getting to experience tastings. We recently visited one of our bespoke suppliers, Lardiere Fine Foods, not only to catch up but also to sample a few of their new creations. Our discovery of this company a few years ago can be likened to finding a diamond in the rough and life with Lardiere has been simple, interesting, creative and delicious. Our food and beverage team consisting of our owner Anthea, Michelle and our consultant, Markye, have spent many an hour discussing, debating and resourcing nutritious, wholesome and organic products to include in our menus and in all suites on the board the trains. The women have trawled South Africa finding local companies with strong values and a moral compass that aligns itself with ours at Rovos Rail. We also want to work with businesses who have ethical farming and practices so that the food is cruelty-free and is made from the best possible ingredients. Enter Chef Junelle, the creator of Lardiere. Culinary life for Junelle began with studies at the Cordon Bleu School with career highlights including working with Ben Filmalter, the founder of Mugg & Bean and his wife, Judy, who introduced Junelle to the world of baking. It wasn’t long after that the inspiration and courage came for Junelle to open her own business and Lardier, which in French loosely means “a pantry where food is kept”, opened its doors. We hear the word pantry and are transported back to the kitchens of our childhoods with smells of biscuits and spices such as nutmeg and cinnamon. Taking a peek into Junelle’s pantry, you will always find the best local olive oil, butter, sea salt, and fresh herbs as she believes that no recipe should have more than a handful of ingredients. And responsible trade is clearly of importance to Junelle. Not only does she want to lay the foundations for new standards in the local hospitality industry but she ensures that her ingredients are locally sourced and that all recipes are preservative-free. 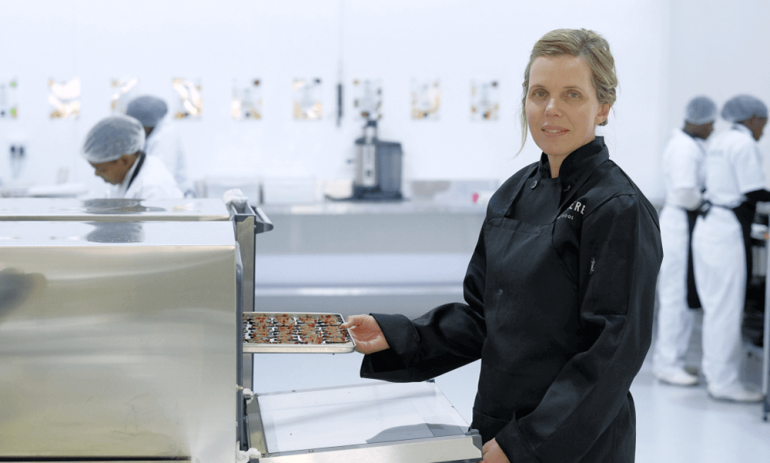 There is a strong focus by all chefs working at Lardiere on developing healthy and tasty gluten and wheat-free alternatives as well as vegan options as their production is 70% plant-based. In addtion, Lardiere is accredited to the South African National Halaal Authority and adhere’s to its strict guidelines. One of our favourite aspects of life with Lardiere is that it’s made up of only female staff as the company is proactive in the support and upliftment of women. 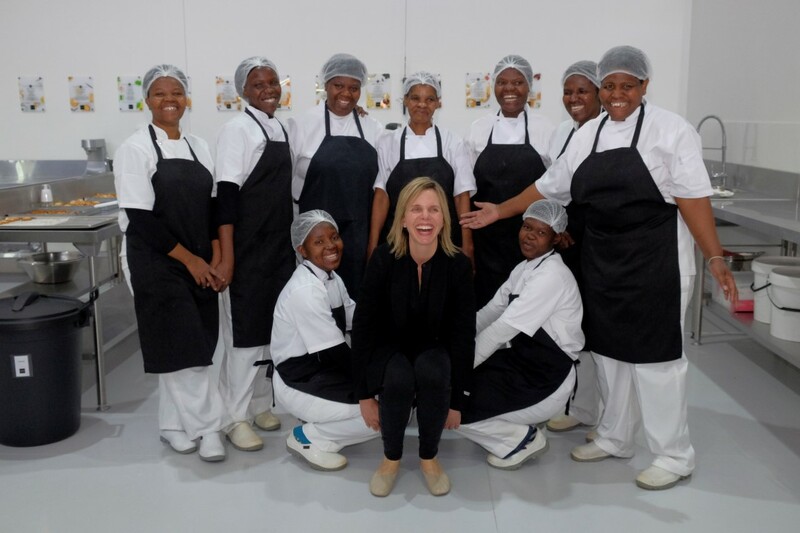 The latest product offering, Bosesi, meaning “sisters” in seTswana, has been created to give the women of the company ownership in a business while taking local South African flavours to the world. We’ve have a variety of Lardiere’s really fine foods on board. In each suite we have a bespoke box containing Coconut Ice, Rosemary Shortbread and Almond and Cranberry Florentines. We’ve also introduced delights such as Roasted Banana Curd, Luxury Melba and Dried Pineapple Slices. We’ve been lucky enough to taste-test most of what Lardiere has to offer and be part of conversations about new recipes being developed which tickles our taste buds! It’s a pleasure working with Junelle and her team as the company is wholesome not only in the products they create but also with their overall ethos. We can also guarantee the hygiene of their on-site kitchen as it is the cleanest space we have ever seen and inspired the big renovation we’re currently doing to ours! Spring on board the Shongololo! It’s almost that time of year when we in the southern hemisphere can pack away our coats and feel the delicious beginnings of another beautiful summer. And we have a special offer that we think will put some spring back in your step! If you’re a resident of South Africa or its neighbouring countries then join us on board Shongololo Express, for a fully inclusive two-night trip from Cape Town to Pretoria at a 50% reduced rate! Guests will board the train at Cape Town Station on Saturday 17 November at 11:00 travelling via Matjiesfontein and Kimberley to Pretoria, arriving Monday 19 November at about 13:30. 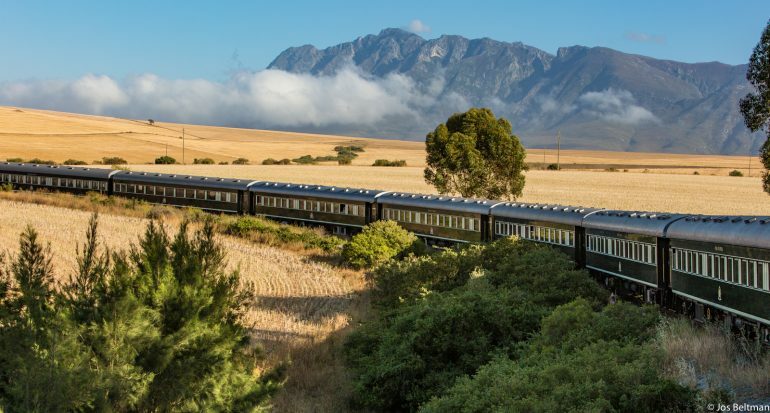 Shongololo Express will travel the same two-night Cape Town itinerary that has been enjoyed by thousands of Rovos Rail guests over a span of nearly 30 years. 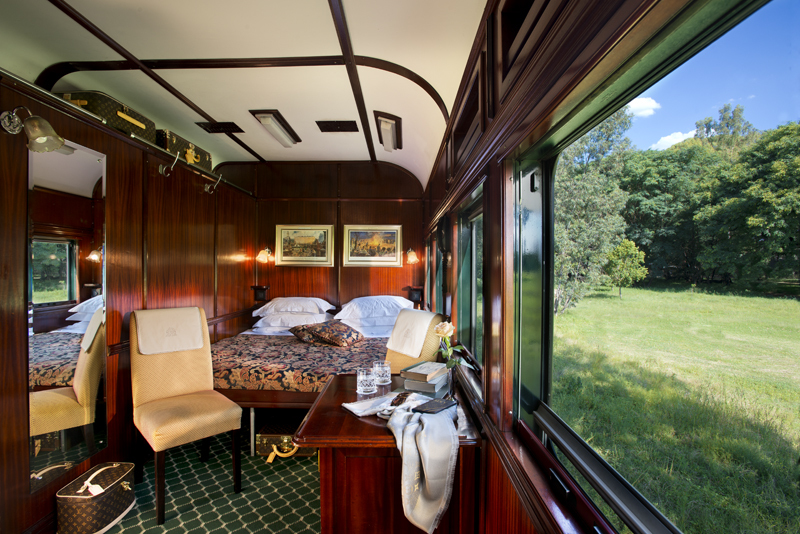 Rates include all meals on board, all alcoholic and other beverages on board, the off-train excursions, room service and a limited laundry service. Not included: Pre- and post-tour accommodation, flights and transfers; staff gratuities; international/French Champagne and souvenirs. T&Cs apply. Offer applicable to residents of South Africa, Botswana, Zimbabwe, Lesotho, Mozambique, Namibia and Swaziland only. All we need from you is a copy of your ID, passport or residency and we’ll take the rest from there. 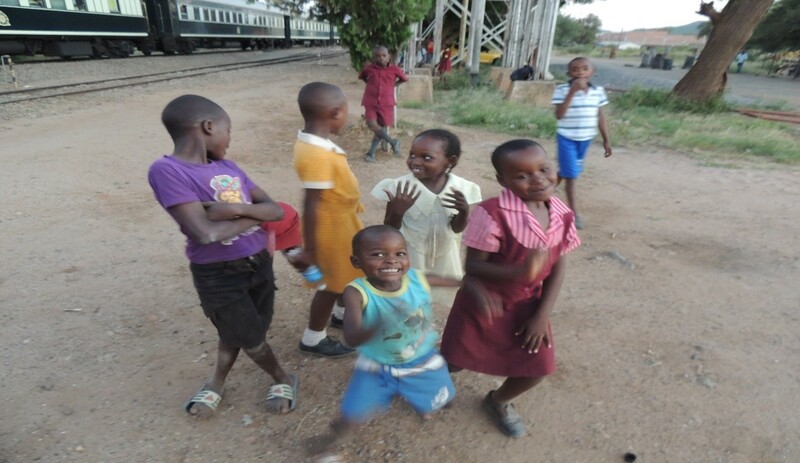 We hope to welcome you on board the Shongololo Express very soon! As I sit here writing this blog post I am eating one of the Spinach King’s vegan and gluten-free spinach muffins. It is a tasty, chewy treat. And when I say chewy I mean it has a delicious consistency that doesn’t feel like you’re eating sand and nor does fall apart in your hands. As someone who has to be gluten-free I have tasted products from all over South Africa and had yet to find a something that tastes good and has a more-ish texture. Enter the Spinach King and his delicious baked goods! Lufefe’s Nomjana’s story is one of those remarkable narratives that is made up of an idea and the courage, self-confidence and determination to pursue it no matter the naysayers or the challenges. In this video, which to me resembles an episode of Chef’s Table, we see Lufefe talking about his life growing up in Khayelitsha, a township located 30km outside of Cape Town’s city centre. He saw how his community was running out of food on a daily basis and it occurred to him that the answer to the food shortages lay in the land on which they walked every day and thus began his idea of community growing, baking and selling spinach-based goods. Lufefe’s journey begins in 2011 when he had only R40 in his pocket and his big idea. He used a friend’s oven to bake 24 loaves of bread a day and then went pedaling door-to-door. Not only was he busy baking and selling but he was also studying Entrepreneurship Development at the Raymond Ackerman Academy and graduated in 2012. In 2013 he moved to the Khayelitsha Spar where he turned 24 loaves into 120 and earned enough money to purchase his own equipment, buy bicycles and employ five people. 2014 was a catalyst for exciting developments at Spinach King as Lufefe won the SAB Innovation Award and used the prize money to open his first bakery. It was also the year he met the Managing Director of Virgin Active and together with the health club brand, Spinach King Health Food Cafe and Bakery opened its doors in 2016! It should also be mentioned that there was quick visit to Italy the year before to attend the We Feed the Planet Expo where Spinach King not only negotiated a supply deal with Hotel Verde but also took home the Western Cape Premier’s Entrepreneurship Recognition Award for Best Emerging Agro-Processing Business! Fast forward to July 2018 and Rovos Rail is in business with Lufefe. We wrote about our food and beverage consultant, Markye Reuvers, in a previous post and how she has been scouting local businesses with ethical and sustainability practices who can meet our produce demands. We’re thrilled to have Lufefe and his spinach on board with us! Walking through our brand new kitchens earlier I just happened upon a chest freezer that contained bags of these delicious muffins. I’m now on my second and pretending that it doesn’t matter that I’m guzzling them down because it’s all in the name of “research” to ensure that our guests are satisfied. Which they will be. 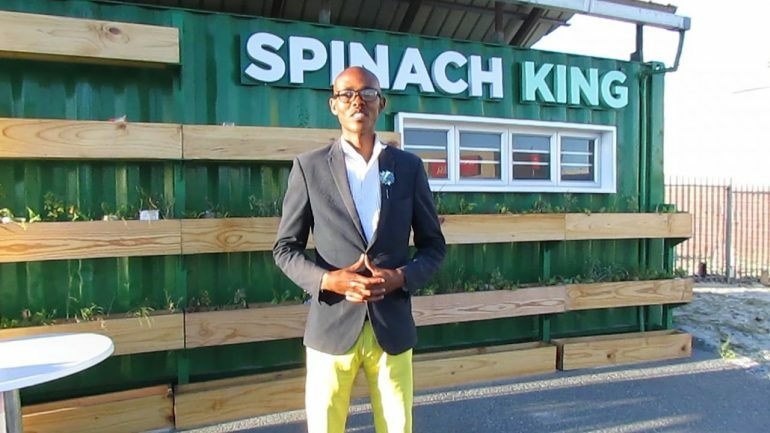 All hail Lufefe, the Spinach King and his environmentally conscious business! 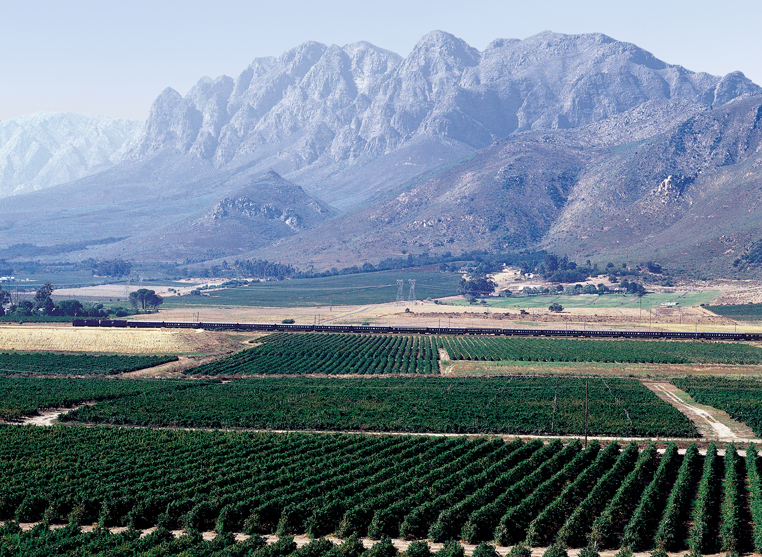 It’s a story that inspires and one of which all Capetonians and South Africans can be proud. The purpose of this blog post is two-fold. 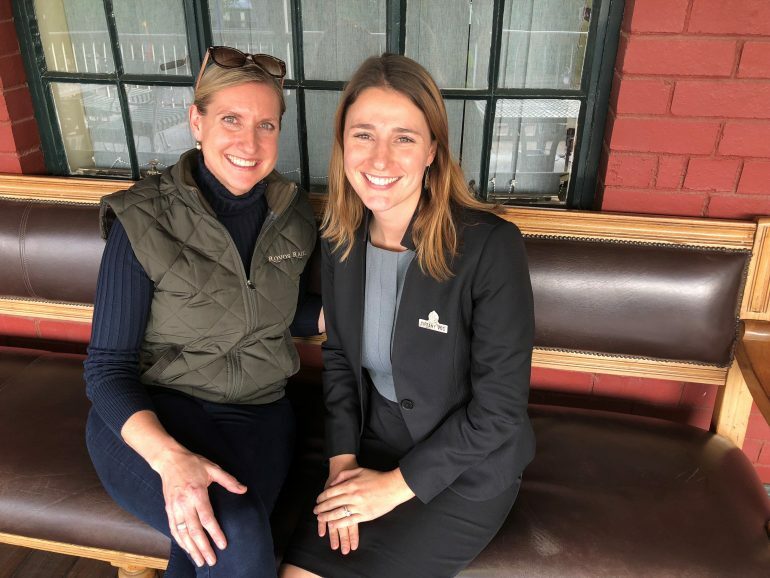 To let you know that we welcomed Tiffany Vos-Thane in an official capacity to Rovos Rail and that soon after her arrival she recruited the expert services of Maryke Reuvers, a professional chef and consultant. Tiffany is Rohan Vos’s youngest daughter and the last of the family to join the business. We’re thrilled to have her and the 12 years of hospitality expertise she brings with her. Welcome on board! It did not take Tiffany long to realise that our Food & Beverage department required a fair amount of TLC. 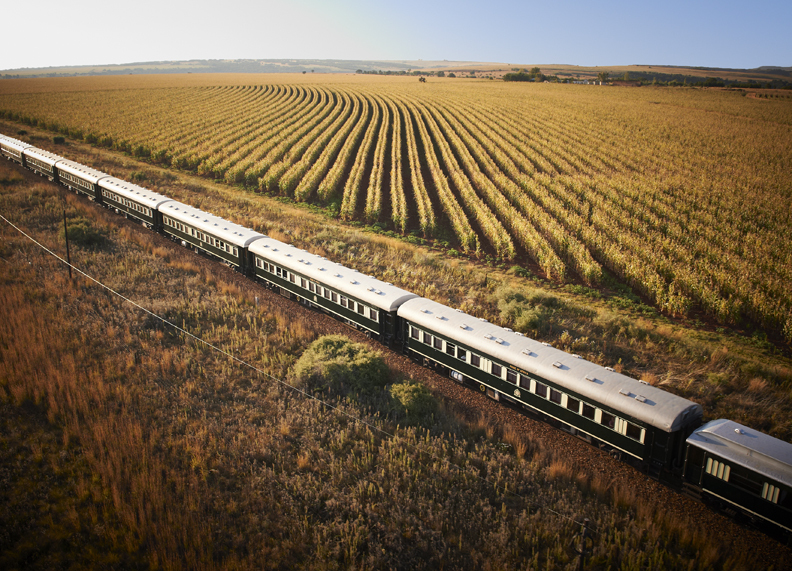 Rovos Rail has grown substantially in the past few years with the opening of three guest houses in Cape Town, the acquisition of our new train, the Shongololo Express as well as launching a new 15-day journey, the Trail of Two Oceans, from Tanzania to Angola. In addition, our workshop teams have been hard at work building new coaches so that we can now have five Rovos trains out at once. An impressive feat for a small, privately-owned company. But back to Tiffany and Markye. Having mostly sales experience in the UK hospitality industry, but with a passion for all things food and wine, Tiffany got to work finding someone who could share in her vision and overhaul our entire Food & Beverage department. It was time to refresh menus, upgrade the bar and wine lists, renovate all the train kitchens and rebuild a brand new on-site kitchen. Chef and kitchen-staff training was also overdue as was food and beverage service. Enter Markye and wow, did she not know what she was getting herself into! It’s been months of spring-cleaning, throwing out, list-making, rearranging, implementing new training and systems, stream-lining and updating current protocols as well as embarking on site visits to newly discovered meat and dairy farms for authentic organic and fresh produce. Markye has also spent time on the trains travelling most of the journeys and working with our chefs in the on-board kitchens. It’s been a ride! And she’s not even halfway done yet. Markye has spent over 17 years in the food industry and has been regaling us with fascinating stories of expeditions to the Russian Arctic, the Greek Islands and of course the South of France. Her work has taken her to many global destinations but now she is based in Cape Town making weekly commutes to our home-base in Pretoria where she can often be found on her all fours cleaning, scrubbing, inspecting or counting stock. We’ve never worked with a chef with such a strong A-type personality so it’s been an incredible experience for us and we have learned a great deal. Both Maryke and Tiffany have been a breath of fresh air we didn’t know we needed, which we think is the best kind. Often, when heads are down and teams are working furiously, the small things begin to slip through the cracks and left unchanged become larger issues. It was time to rehabilitate everything to do with food and beverage and we are thrilled to have these two talented and hard-working women at its helm. We look forward to sharing in our new bar, wine and food menus with you and welcome your feedback. Cheers, saluti and santé to Tiffany and Maryke, a big welcome and thank you! On Tuesday, 10 July 2018, the Convair took off from Wonderboom Airport in Pretoria for a scenic flight before its planned departure for Holland the following day. In April this year Rovos Rail donated the aircraft to Aviodrome, an aviation museum and theme park situated in Leylstad which is approximately 50km from Amsterdam. The flight was being piloted by Captain Ross Kelly and Doug Hayward, two experienced pilots from Australia who had successfully flown sister Convair ZS-ARV to Australia in August 2016. Rovos Rail had donated the aircraft to the Historical Aviation Restoration Society based at Albion Park south of Sydney. On Tuesday afternoon the plane experienced engine failure on takeoff and crashed just outside Wonderboom Airport. Sadly engineer Chris Barnard died in the accident. He was an experienced engineer and pilot and had been intimately involved with the Convairs for 17 years. Captains Ross Kelly and Doug Hayward were injured and transported by helicopter to Milpark Hospital in Johannesburg where they are in induced comas, but stable. The prognosis is optimistic. Rovos Rail is supporting Aviodrome and the SA CAA with the subsequent investigation. 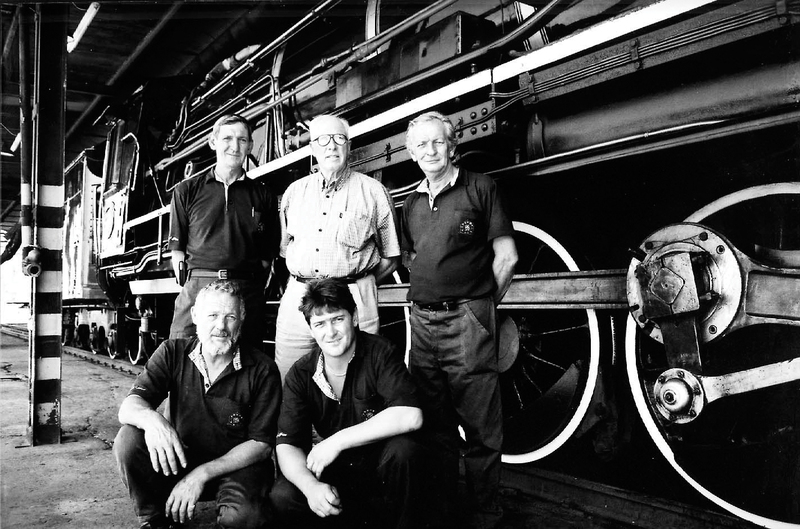 From our humble beginnings in 1989 a focus of ours has always been preserving what little is left of the era of steam and the golden age of rail travel. In our 29 years we have collected artifacts, yes, but the most incredible and incredulous stories and sentiments. Our museum at our private station in Pretoria is one way we treasure not only our history but also all the stories, some of which are legend. 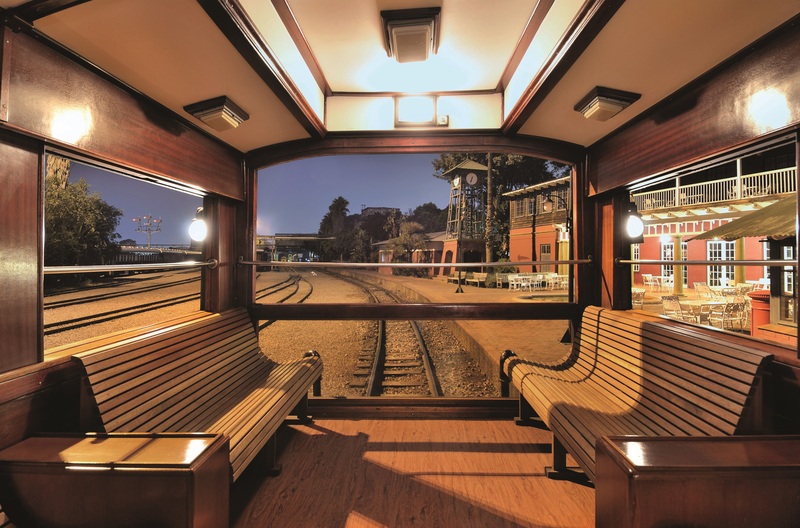 Guests have expressed their sentiments at us being custodians of a rich part of South Africa’s rail history and the stories which we tell in our little museum. Renate Engelbrecht from Travelling Mystery Guest visited us recently and penned a piece on our station, Oom Gert and his careful curatorship of our museum. 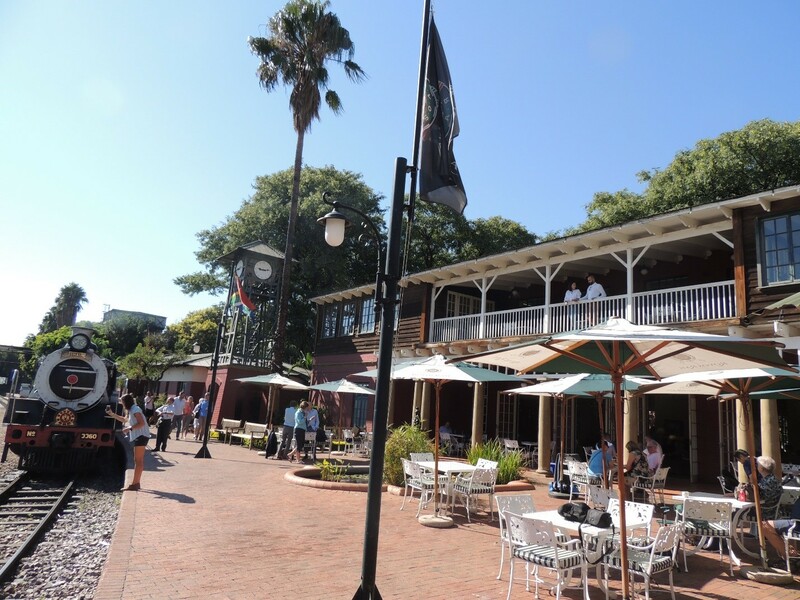 Like the Rovos Rail family business, the Capital Park station has many stories to tell. 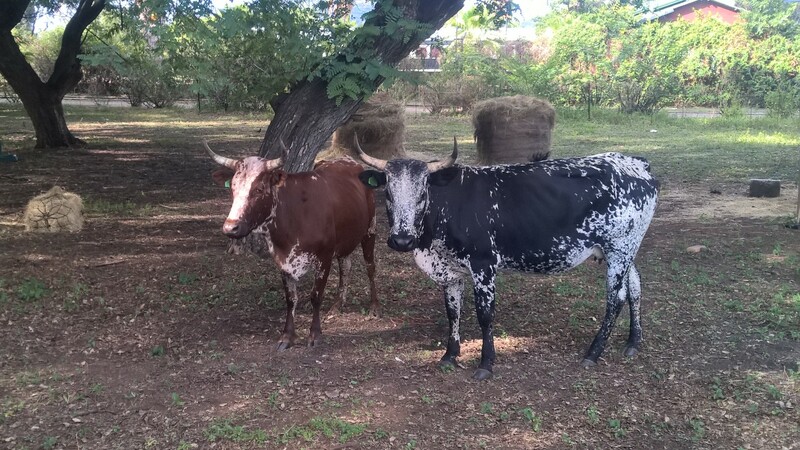 It’s a historical gem tucked away among Pretoria’s CBD, the National Zoological Gardens and African tuck shops. The station, built in 1948, from which Rovos Rail departs, also plays its role of heyday holiday start-off point and preserver of all things train, very well. 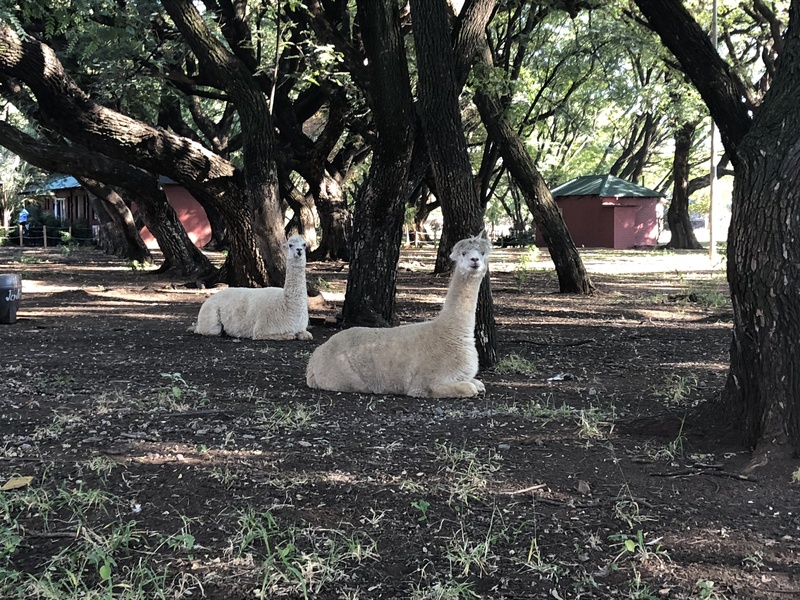 The station grounds are filled with animals – from lamas lying in the staff’s garages that greet you with weird looking faces, to an on-site Nguni herd. But, it is Oom Gert who welcomes you at the Railway Museum. The 40-hectare station first belonged to South African Railways, with many different locomotives and train drivers that drove these trains into many different directions. After moving to another depot, though, the station became dilapidated and was later taken over by Rovos Rail, who has brought the station back to its former glory. Today Rovos Rail’s trains depart from here to Cape Town, Durban, Victoria Falls, Namibia, Dar Es Salaam and soon also Angola, with the whole complex posing as a museum. Rovos Rail has given the station a proper revamp and kept historically relevant artifacts intact for train passengers and visitors to appreciate. The main station building, previously a dining hall for artisans, has been prettied up and they’ve added a clock tower to enhance the station’s ambiance. The steam and diesel loco shed has also been cleaned up. Most of the structures have either been rebuilt or are converted ex-SAR buildings. 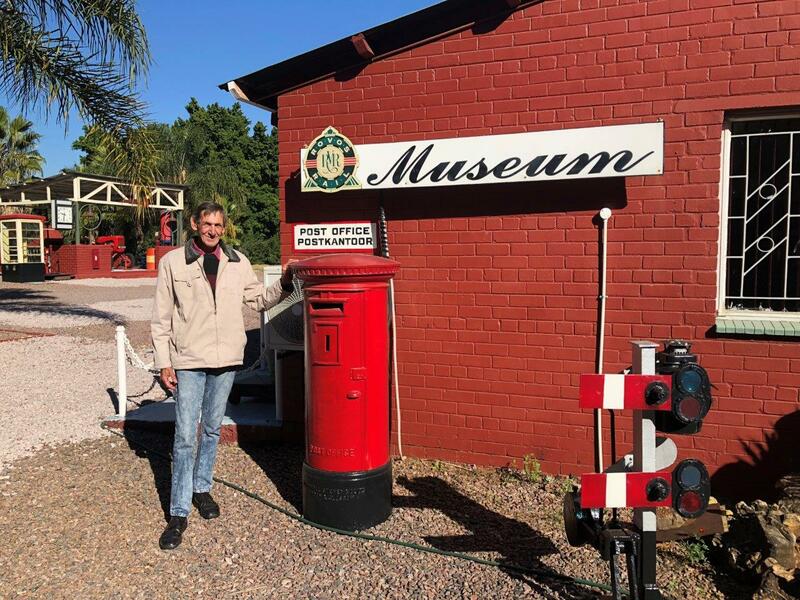 The on-site Railway Museum is mainly focused on the tourists embarking on their Rovos Rail journeys, but Oom Gert, the curator, welcomes anyone. 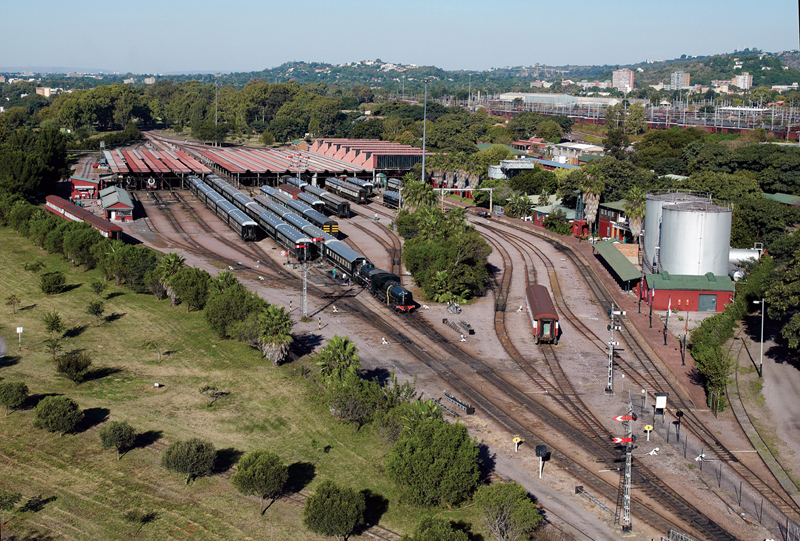 The museum is constantly developing, and it is the Vos family’s goal for Rovos Rail Station to become the leading working train museum globally. The museum is small and quaint and takes passengers back to their childhoods with an original phone box, parking meter and old trains, as well as special collector’s items that have been beautifully kept. It’s like exploring a bygone era when you step into the station building. 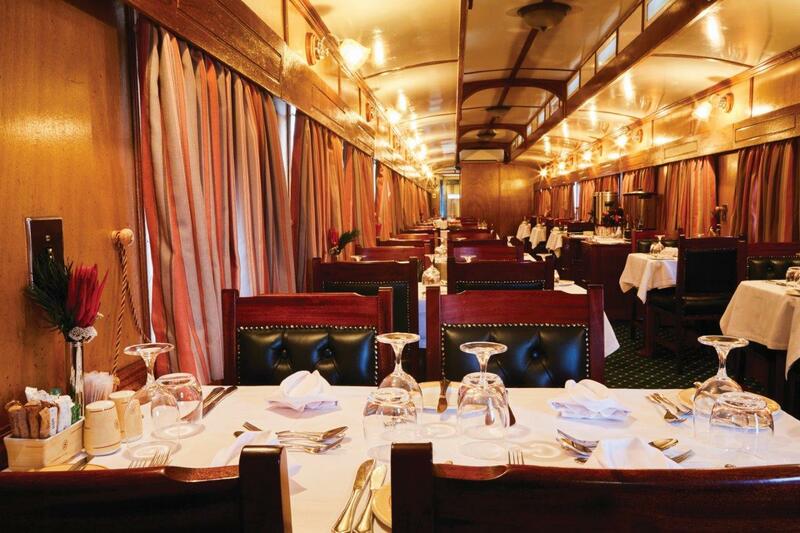 Even before you set foot on the luxury train that has been voted one of the top seven trains in the world by wired.com, you are taken on a trip down memory lane. 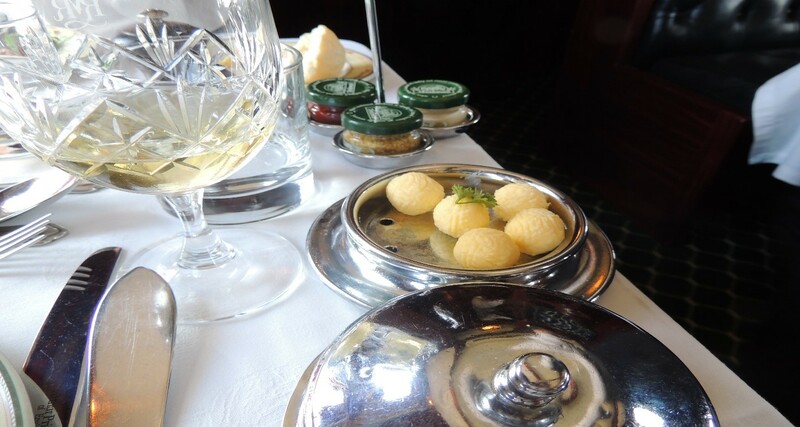 The station lounge has a certain elegance to it and takes you back to a time when you had to dress up for dinner and where sophistication was key. 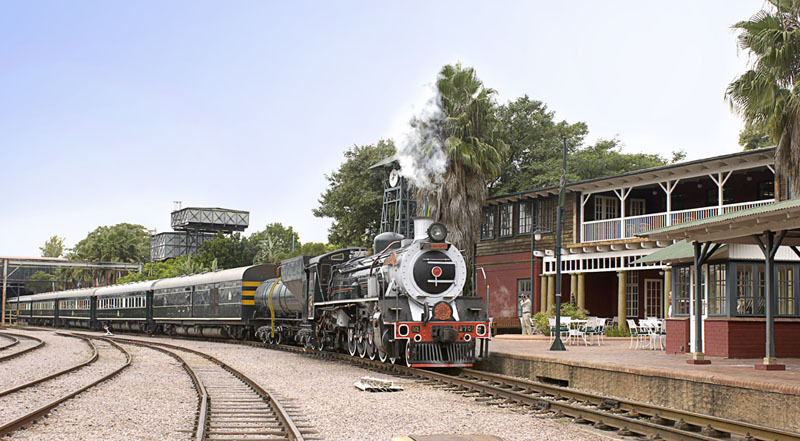 Rovos Rail Station serves as the departure and arrival point for all eight journeys on offer and passengers rave about the welcoming experience and the colonial atmosphere of the station. 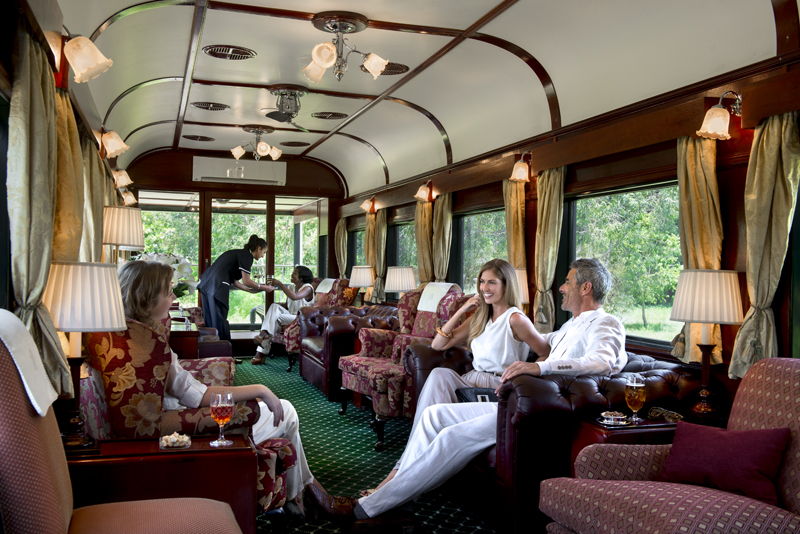 Rovos Rail’s guests are received with elegant welcoming drinks and canapes at the station and are often given an introductory speech by the owner, Rohan Vos, which sets the tone for the exciting journey ahead. 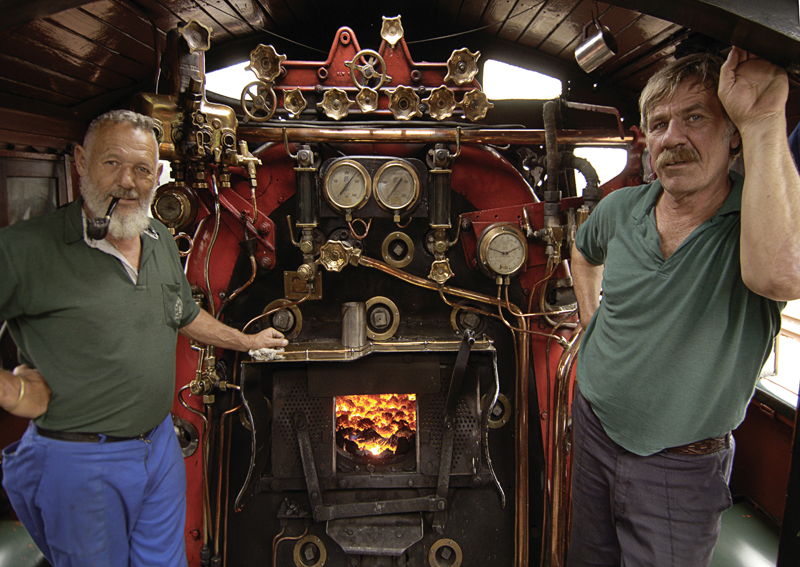 Vos then also habitually takes guests on an informative and educational tour around the station grounds before the train’s wheels start turning, explaining the workshops and loco sheds to them with unfailing enthusiasm. The museum, marshalling yards, train renovation and repair facilities and welcome centre are all run by him. 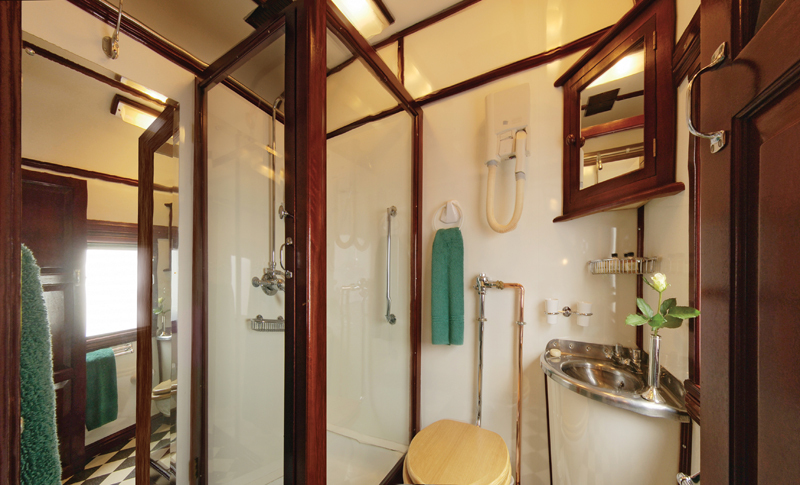 Owner, Rohan Vos, is an enthusiast of note and with the help and support of his family, he has brought Rovos Rail and its station to what it is today.